Not to be confused with River Deep – Mountain High. "I Can't Believe You Love Me"
"Aint No Mountain High Enough"
"Ain't No Mountain High Enough" is an R&B/soul song written by Nickolas Ashford & Valerie Simpson in 1966 for the Tamla Motown label. The composition was first successful as a 1967 hit single recorded by Marvin Gaye and Tammi Terrell, becoming a hit again in 1970 when recorded by former Supremes frontwoman Diana Ross. The song became Ross' first solo number-one hit on the Billboard Hot 100 chart and was nominated for a Grammy Award. The song was written by Ashford and Simpson prior to joining Motown. British soul singer Dusty Springfield wanted to record the song but the duo declined, hoping it would give them access to the Detroit-based label. As Valerie Simpson later recalled, "We played that song for her (Springfield) but wouldn't give it to her, because we wanted to hold that back. We felt like that could be our entry to Motown. Nick called it the 'golden egg'." Dusty recorded a similar verse melody in 'I'm Gonna Leave You' on Dusty. The original 1967 version of "Ain't No Mountain High Enough" was a top twenty hit. According to record producers, Terrell was a little nervous and intimidated during recording because she did not rehearse the lyrics. Terrell recorded her vocals alone with producers Harvey Fuqua and Johnny Bristol, who added Gaye's vocal at a later date. 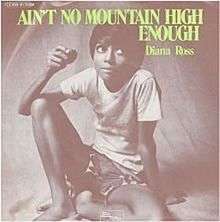 "Ain't No Mountain" peaked at number nineteen on the Billboard pop charts, and went to number three on the R&B charts. 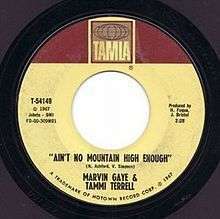 This original version of "Ain't No Mountain", produced by Fuqua and Bristol, was a care-free, danceable, and romantic love song that became the signature duet between Gaye and Terrell. Its success led to a string of more Ashford/Simpson penned duets (including "You're All I Need to Get By", "Ain't Nothing Like the Real Thing", and "Your Precious Love"). The Gaye/Terrell version was inducted into the Grammy Hall of Fame in 1999, and is regarded today as one of the most important records ever released by Motown. "Can't It Wait Until Tomorrow"
(1970) "Ain't No Mountain High Enough"
Diana Ross & The Supremes recorded a version of "Ain't No Mountain High Enough" which was more faithful to the Terrell-Gaye original version as a duet with The Temptations. That song was an album cut from a joint LP released by Motown Records in 1968 on the two superstar groups, titled Diana Ross & the Supremes Join The Temptations. In late 1969, after the Top 20 success of her first solo single, "Reach Out and Touch (Somebody's Hand)", Ashford and Simpson had Ross re-record "Ain't No Mountain High Enough". Initially, Ross was apprehensive, but was convinced to make the recording. The cover produced a version similar to gospel with elements of classical music strings (provided by the Detroit Symphony Orchestra), spoken word passages from Ross, with The Andantes, Jimmy Beavers, Jo Armstead, Ashford & Simpson and Brenda Evans and Billie Calvin of The Undisputed Truth as backing singers, giving the song a soul and gospel vocal element. Motown chief Berry Gordy did not like the record upon first hearing it. He hated the spoken-word passages and wanted the song to begin with the climactic chorus/bridge. It was not until radio stations nationwide were editing their own versions and adding it to their playlists that Ashford and Simpson were able to convince Gordy to release an edited three-minute version as a single. Ross' version of "Ain't No Mountain High Enough" rose up to number one on both the pop and R&B singles charts. Ross received a Grammy nomination for Best Female Pop Vocal Performance. This version is in the key of C minor. Hugh Masekela included the song in his 1968 album The Promise of a Future. In 1981, American Disco band Inner Life from Salsoul Records released their version, which topped #20 on US Dance Chart. The Boys Town Gang formed a medley of the two songs "Remember Me" and "Ain't No Mountain High Enough" in 1981. The single was a club hit. Australian singer Jimmy Barnes released an album of soul covers titled Soul Deep in 1991, including his rock version of "Ain't No Mountain High Enough". This cover reached #28 in Australia in 1992. The song is performed over the credits to the 1993 film Sister Act 2: Back in the Habit. It is performed by Whoopi Goldberg and the rest of the cast. Also in 2000, Dutch airline carrier KLM used the Supremes/Temptations version in a commercial. In 2000, Disney featured the song in the sports drama film Remember the Titans. Both in 2003 and 2004, Swedish girl group Play covered the song on their albums Play, and Don't Stop the Music with both members Janet Leon, and Fanny Hamlin. In 2005, the Diana Ross version was featured at the end of the animated film Chicken Little. In 2006, Australian vocal group Human Nature included a cover on the second album of their Motown trilogy, Dancing in the Street: the Songs of Motown II. The album debuted at #1 on the ARIA charts. Also in 2006, Michael McDonald included a cover on the first of his Motown trilogy, Motown. In 2011, the song was re-recorded by Paul Epworth and used in a commercial for DHL. In 2011, the French singer Chimène Badi recorded a version with the singer Billy Paul. In 2013, Michael Bolton covered the song, which featured Kelly Rowland, for his 2013 album Ain't No Mountain High Enough – Tribute to Hitsville. In the 2014 film Guardians of the Galaxy, by Marvel Studios, the original version was used in the epilogue, and was part of Peter Quill's Awesome Mix Vol. 2 Cassette tape. It was used in the 1999 film Our Friend, Martin. ↑ "Valerie Simpson interview; Ashford and Simpson remembered". Chicago Tribune. ↑ Chin, Brian (2001). Liner notes for Marvin Gaye & Tammi Terrell: The Complete Duets. New York: Motown Records/UMG Recordings. ↑ Whitburn, Joel. The Billboard Book of Top 40 R&B and Hip-Hop Hits. New York, NY: Billboard Books, 2006. Print. ↑ Whitburn, Joel (2004). Top R&B/Hip-Hop Singles: 1942–2004. Record Research. p. 501. 1 2 "1969: The Top 100 Soul/R&B Singles". Rate Your Music. Retrieved 2016-09-30. ↑ "Archived copy". Archived from the original on January 13, 2016. Retrieved 2016-05-27. ↑ David Kent's "Australian Chart Book 1970–1992" Archived March 5, 2016, at the Wayback Machine. ↑ "Top 100 1970 - UK Music Charts". Uk-charts.top-source.info. Retrieved 2016-09-30. ↑ "Top 100 Hits of 1970/Top 100 Songs of 1970". Musicoutfitters.com. Retrieved 2016-09-30. ↑ "Allmusic: Inner Life – Awards". Billboard. Retrieved 2016-02-23. ↑ "DHL Express presents "The International Specialists"". DHL. May 31, 2011. Retrieved September 5, 2011. "What's the Matter with You Baby"
"What Good Am I Without You"
"Take This Heart of Mine"
"If I Could Build My Whole World Around You"/"If This World Were Mine"
"Keep On Lovin' Me Honey"
"You Ain't Livin' till You're Lovin'"
"Good Lovin' Ain't Easy to Come By"
"Gonna Give Her All the Love I've Got"
"I Want to Come Home for Christmas"
"You're a Special Part of Me"
"You Sure Love to Ball"
"My Mistake (Was to Love You)"
" Since I Had You"
"The World Is Rated X"
"Let's Get It On (The M.P.G. Groove Remix)"
"Touch Me in the Morning"
"Reach Out (I'll Be There)"